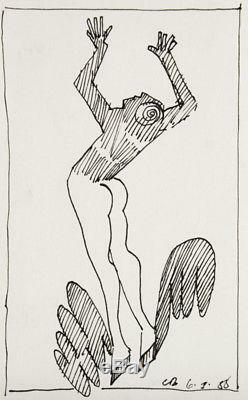 This unique, original pen drawing was sketched during Blackman's time spent at the West Australian Ballet. Commissioned in 1988 by W A Ballet Artistic Director Barry Moreland to design a backdrop for his original ballet'The Celestial Mirror', Blackman immersed himself in rehearsals, watching dancers stretch and perform in order to better understand their movements, energy and character. A truly intimate and memorable encounter, Blackman writes of his experience in the original catalogue'Visions' that there were'millions of notes, thousands of brush strokes, all those wracked limbs. And it has taken half a year, non-stop [to design the backdrop] - and that is just the physical time. The dreaming time in incalculable... It is without a doubt that this evocative drawing will continue to inspire you for years to come, just as the dancers inspired Blackman. 'Leaping High (From the Ballet Series)', 1988. 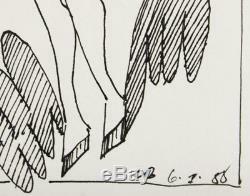 20 x 13 cm (height x width). Signed with initials CB and dated, lower right. Very Good: Describes a work of art's image As New, but may show some small signs of surrounding wear. There are no tears to paper margin or disruption to paint surface. Image is in Fine condition. All original works of art are accompanied by a Letter of Provenance from Angela Tandori Fine Art. Do you need this work of art framed? At Angela Tandori Fine Art, we offer specialist advice for custom framing. Local clients are welcome to consult with us at our Collingwood showroom, or Hawthorn workshop. Alternatively, we also offer online consultation for clients who are busy, located outside of Melbourne or both. To find out more, please message us. At Angela Tandori Fine Art, we want to empower Confident Collectors. We know that starting an art collection can be daunting - markets fluctuate, trends waver and theories permeate. Start with art that speaks to you. Whether you're drawn to art for its audacity, power or narrative, discovering what you love is exciting. And to ease the process, we're here to help with advice, services and consultation. Start your own art collection today and tell your story. Our director, Angela Tandori is a second generation art dealer who begun working in the industry in 1998. Armed with vast experience in auctioning, valuing, exhibiting and consulting in Australian art, Angela has honed her vision for the modern collector. Plus, sheâs an avid art collector herself! How can I pay you? For most works of art the answer is yes! Does the item include GST? Yes, collection by appointment is available. Our showroom is in Collingwood Victoria. How do you package works of art? Unframed items are wrapped in archival material and bubble wrap. Framed items are encased in paper or bubble wrap and cushioned with bubble wrapped corners. With over a decade experience packing fine art, we do our utmost to ensure your work of art arrives safe and sound. How do you transport items? At Angela Tandori Fine Art we provide customised solutions for transporting art WORLDWIDE. Depending on the item and your location we may use Australia Post, local or international couriers or a specialist fine art courier. When will my item be dispatched? Nevertheless, we will let you know. Do you transport works of art with glass? Australia Post and regular couriers do not take responsibility for breakage of glass. If you item contains glazing it will be removed from the frame when posting. Custom solutions for fragile items may include replacing the glass with perspex âplasticâ glass at extra cost or using a fine art courier that ships glass. Enquire if you would like to explore solutions customised to your location and item. Yes, however please note that Australia Post does not provide tracking for its economy service. Is there anything else I should know about international transport? What if item arrives damaged? We will request photographic documentation of the damage and that you retain the original packaging. The item "Charles BLACKMAN Leaping High (From the Ballet Series) original signed painting" is in sale since Tuesday, October 10, 2017. This item is in the category "Art\Paintings". The seller is "angelatandorifineart" and is located in VIC Australia. This item can be shipped worldwide.